summer timeeee!!! actually though, i dont know why people are always excited about summer. everywhere i have ever lived, summer just means its over 100 degrees every day. when i got into my car yesterday my thermometer said 109 degrees. its the first week of may. oy vay. 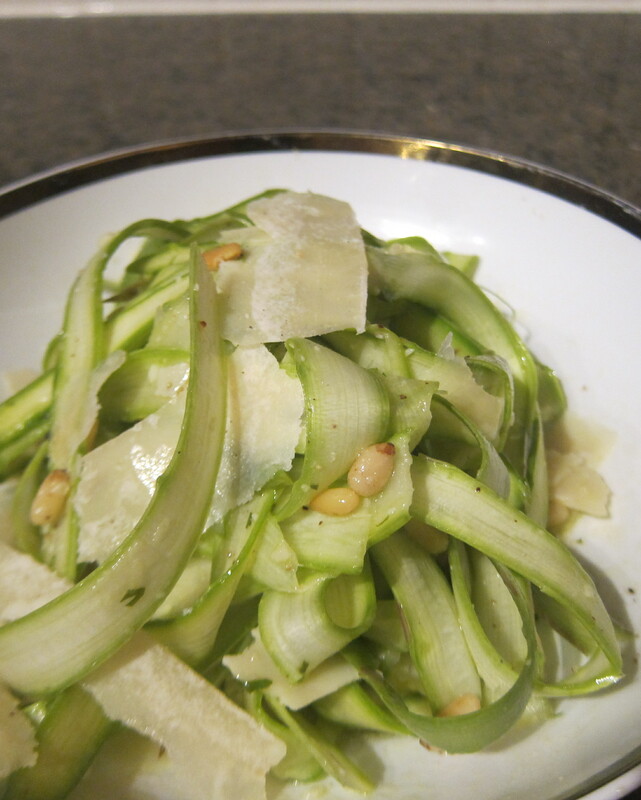 enter: shaved asparagus salad with toasted pine nuts, parmiggiano reggiano and a meyer lemon cilantro vinaigrette. lets talk about meyer lemons. different than your standard lemon? yes. really fragrant and fruity, not quite as tart. meyer lemons are actually in season in early spring but whatever, they are the bomb.com. 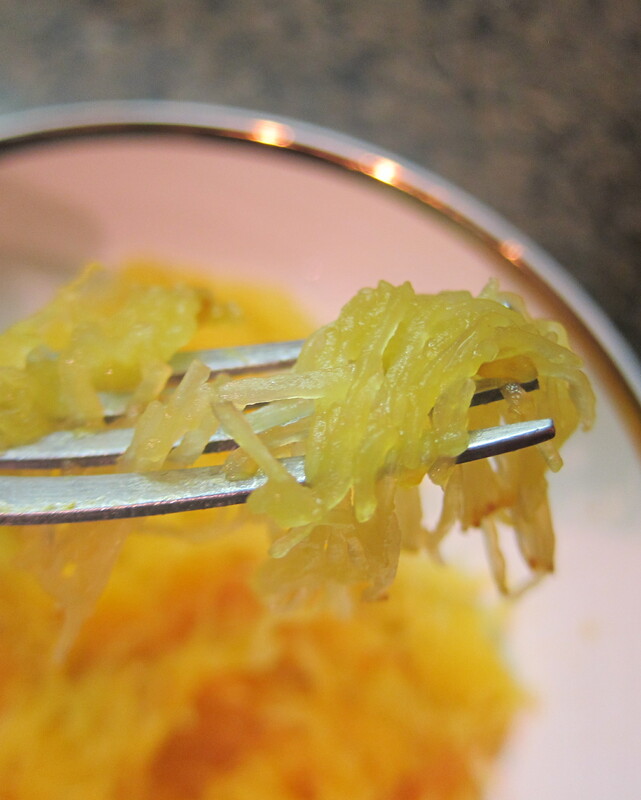 using a vegetable peeler, shave each asparagus into ribbons. unfortunately it’s difficult to shave once you get past the halfway point of the asparagus. i just saved all of these bits to use later in a frittata or another salad. 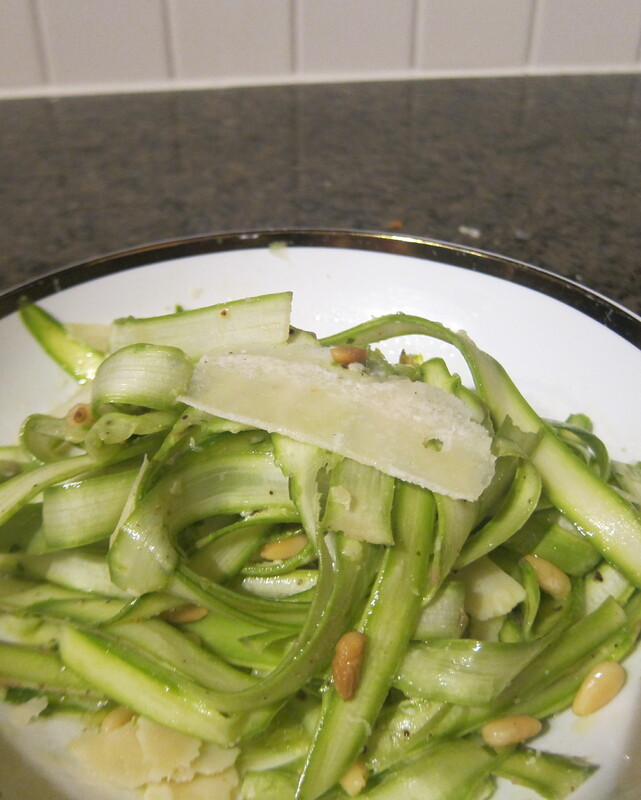 reserve all your shaved asparagus ribbons in a bowl, tossed with the pine nuts. 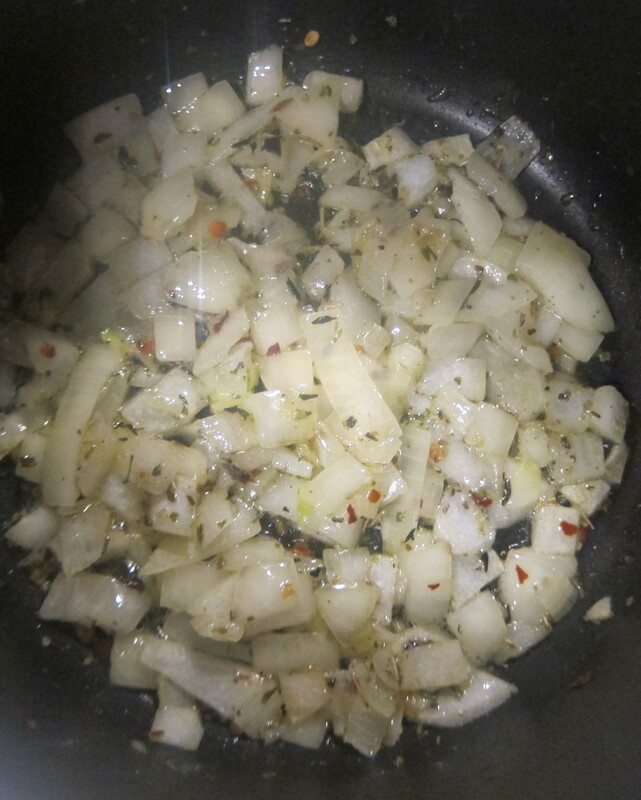 to make the vinaigrette, combine the herbs, lemon juice, balsam vin, salt and pepps in a bowl. 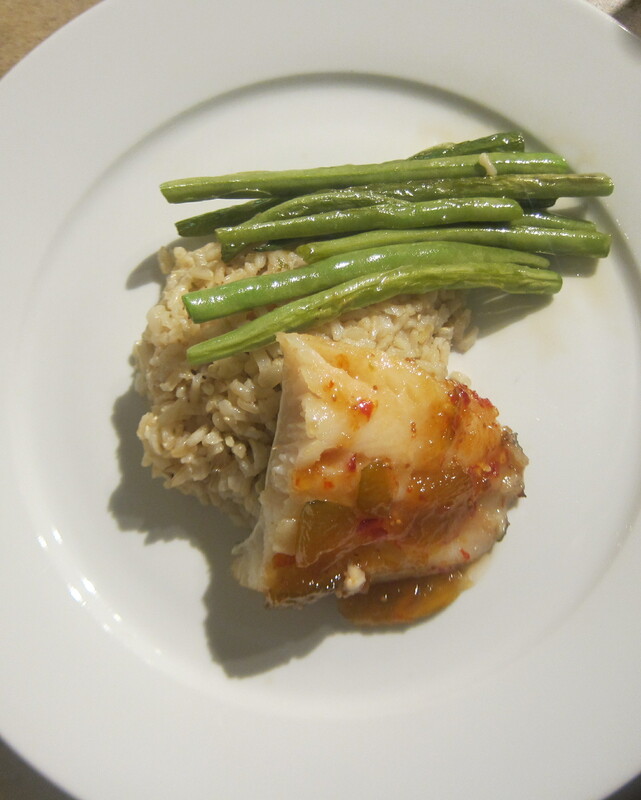 while whisking, stream in olive oil until the vinaigrette comes together and thickens. taste and adjust seasonings. once you are ready to serve, toss the asparagus and pine nuts with enough vin just to happily moisten but not drench the ribbons. top with shaved parm! I LOVE KALE CHIPS. 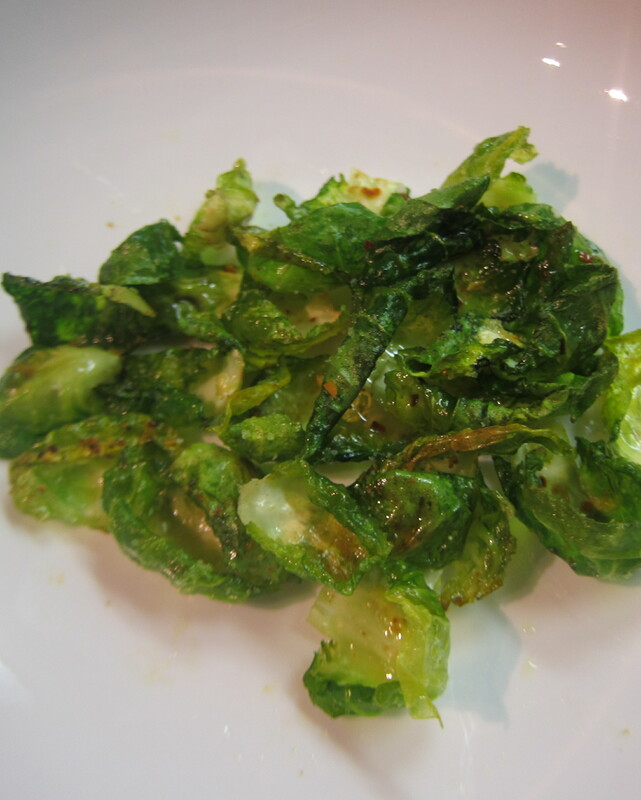 so then i thought O_M_G what if I make brussel sprout chips!! and then, this awesome creation was born. super healthy. super delicious. same idea as kale chips but totally different flavor, so go ahead, switch it up! 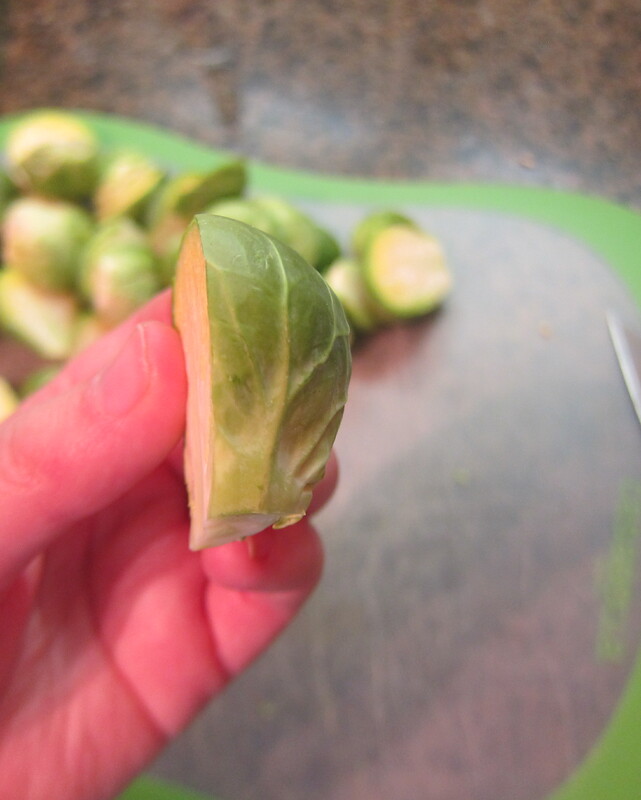 so, remove the outer leaves from the brussel sprouts, most of them should be easy to peel off..it gets more difficult as you go on because the leaves get smaller. 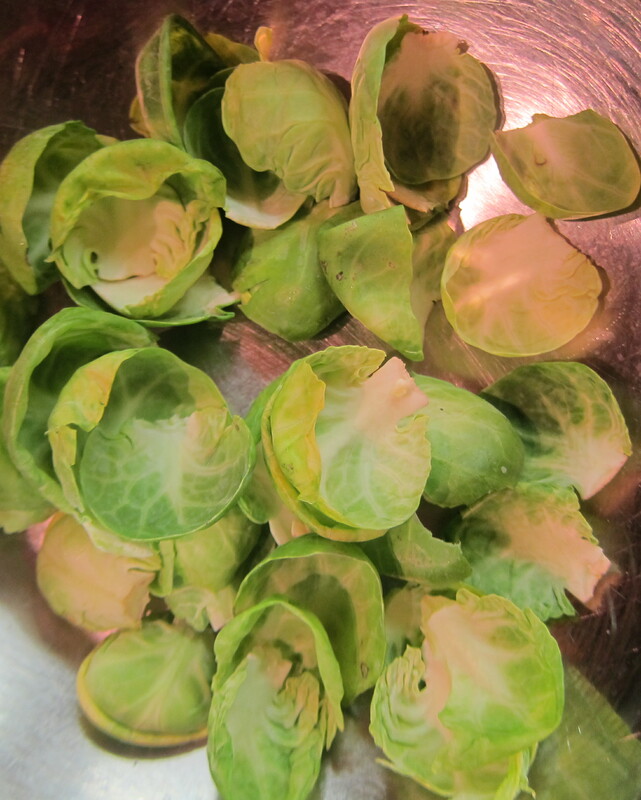 so you really won’t get more than 5 or 6 leaves off each sprout. sometimes you only get 2 good leaves off. you want them to look pretty so you want the whole leaf, not ripped pieces. 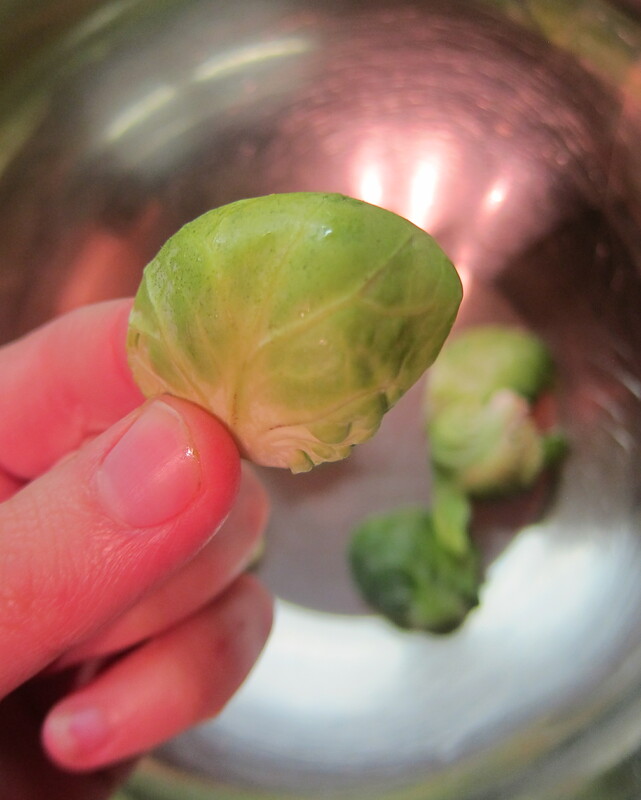 so, carefully and slowly peel off as many leaves as you can from each brussel sprout and put them into a bowl. 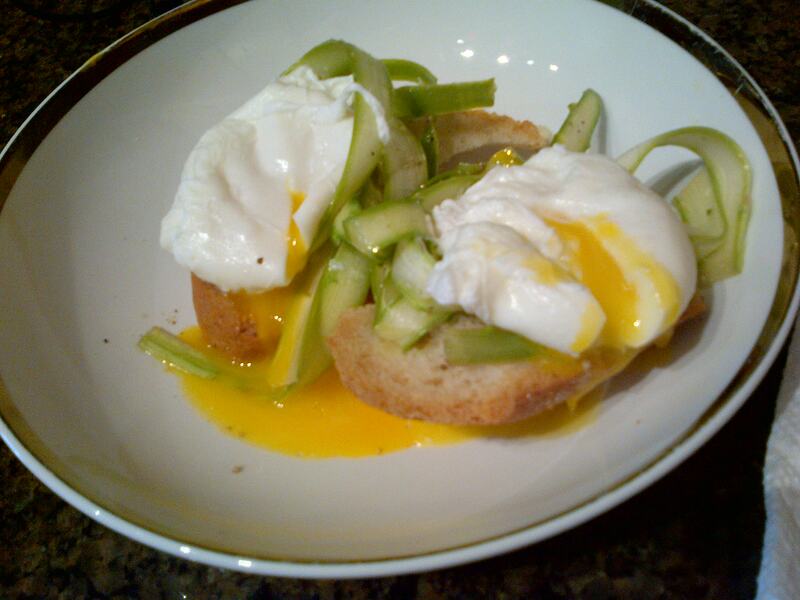 toss with the teaspoon of olive oil, just enough to lightly coat them. season liberally with salt. 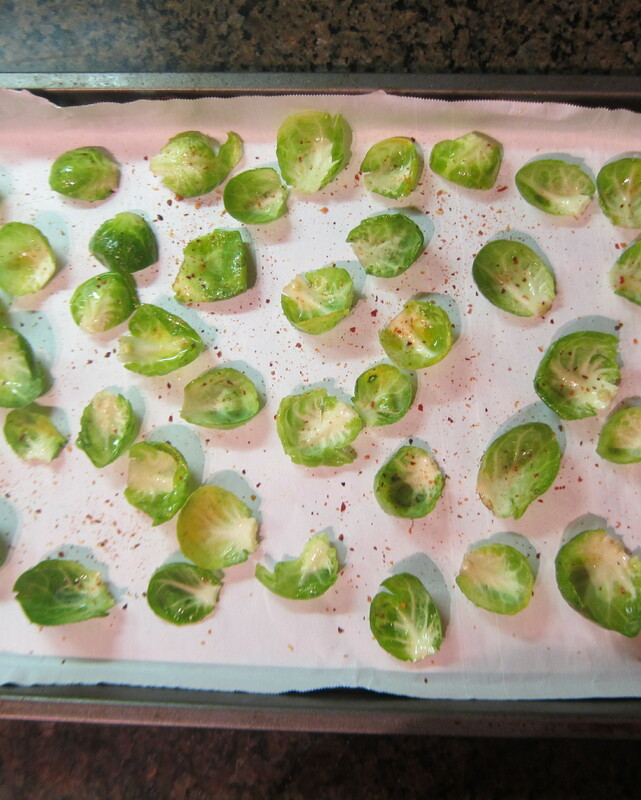 (taste one to check the saltiness) lay them spread apart in a single layer on a baking sheet lined with parchment. 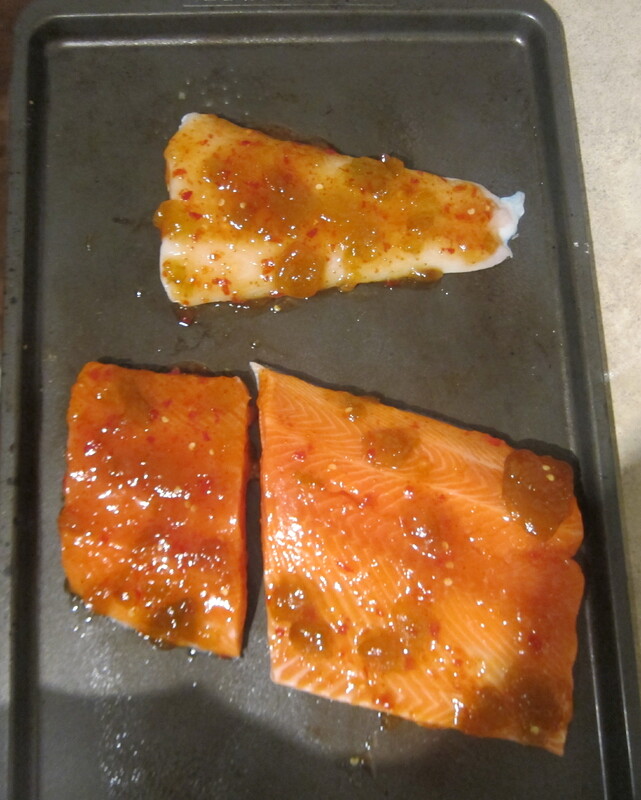 sprinkle with crushed red pepps and bake about 12-18 minutes until they are really crispy but NOT browned or burnt! 1.5 cups of small tomatoes sliced in half (cherry, grape etc. i use the little mixed box of orange, red, yellow and green varieties) but whatever you have on hand or is cheapest is fine! crushed red pepper, dried thyme, dried sage to taste. preheat the oven to 375. using a SHARPPPPP knife. 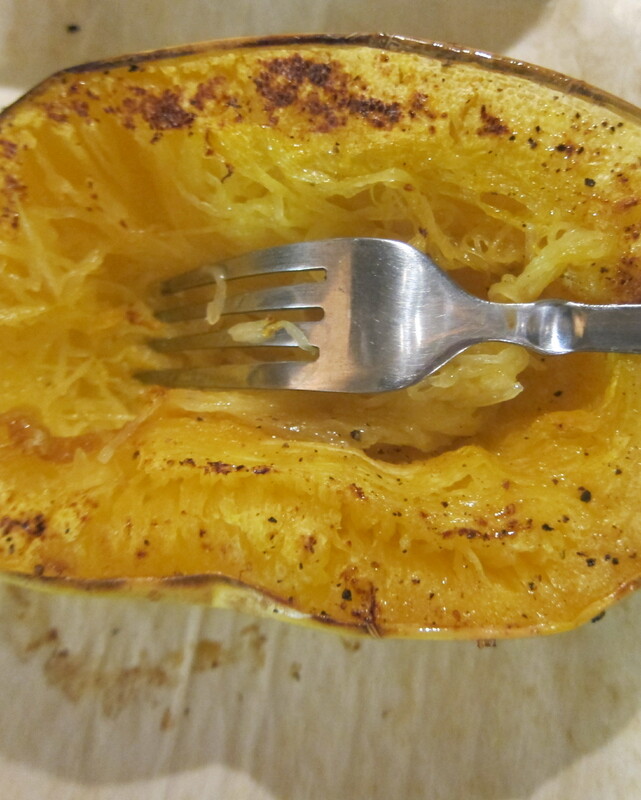 cut the spaghetti squash in half length wise and scoop out the seeds. put 1/4 of a T of oil on each half, rub it around and then coat with salt and pepper. 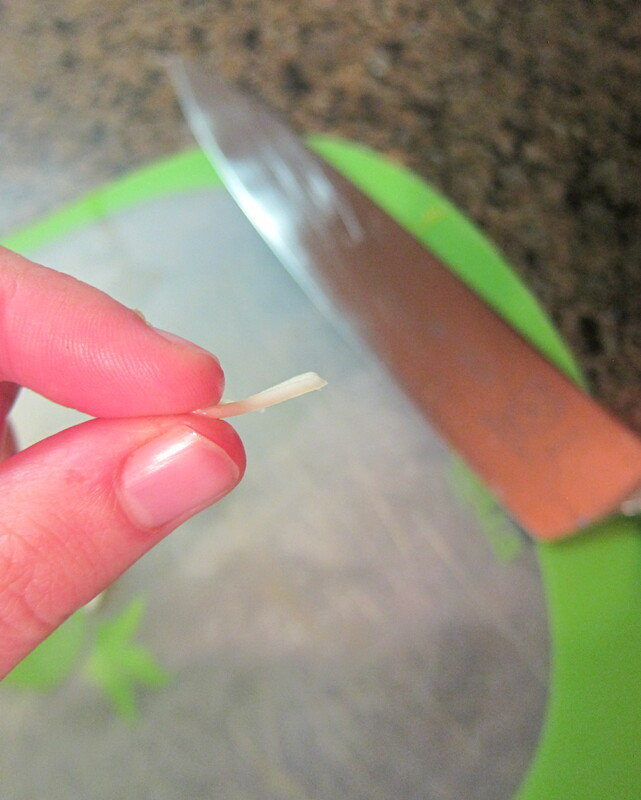 lay it cut side UP (lots of recipes tell you cut side down but i have my own agenda here.) on a lined baking sheet and place it in the oven for likkeeee 25 mins. checking periodically to make sure that it’s not getting too brown (if it is, flip it over, if it’s not-let it do its thang) after 25-30 minutes, flip the squash over so it’s cut side down and continue baking about another 10 minutes. at that point you can (carefully, it’s hot) check how tender it feels and if needed put it in for another few minutes. 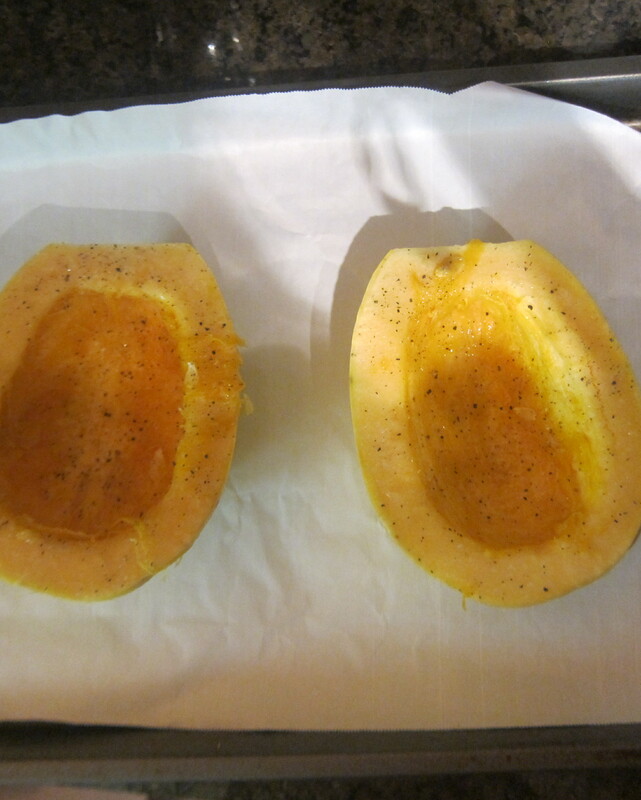 it takes about 40-45 minutes total to roast the squash. why do i do it cut side up? 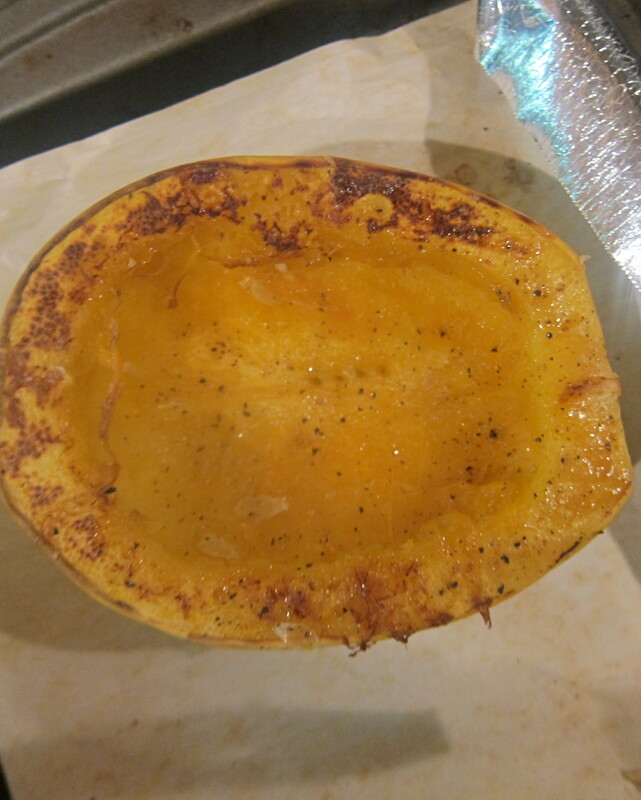 because i like to get the squash slightly caramelized and brown. it really enhances the flavor. if you roast it cut side down the entire time then the part you eat gets no happy color. and that is sad for my taste buds. 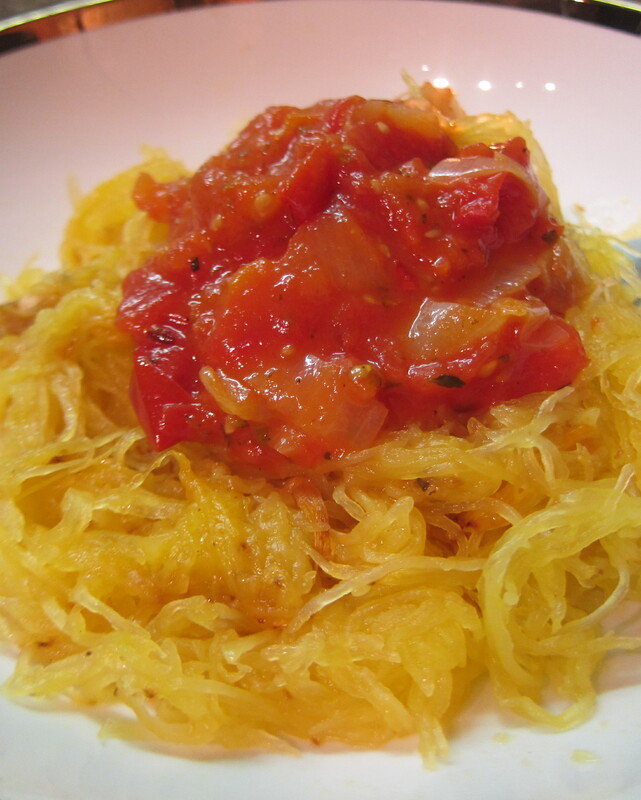 so, once it is ready–get the squash spaghetti-ing! using tongs to hold the squash in it’s place (its HOT HOT HOT) use your other hand to rake the squash lengthwise with a fork to pull out the spaghettis into a bowl. YAY now you have your “spaghetti”. 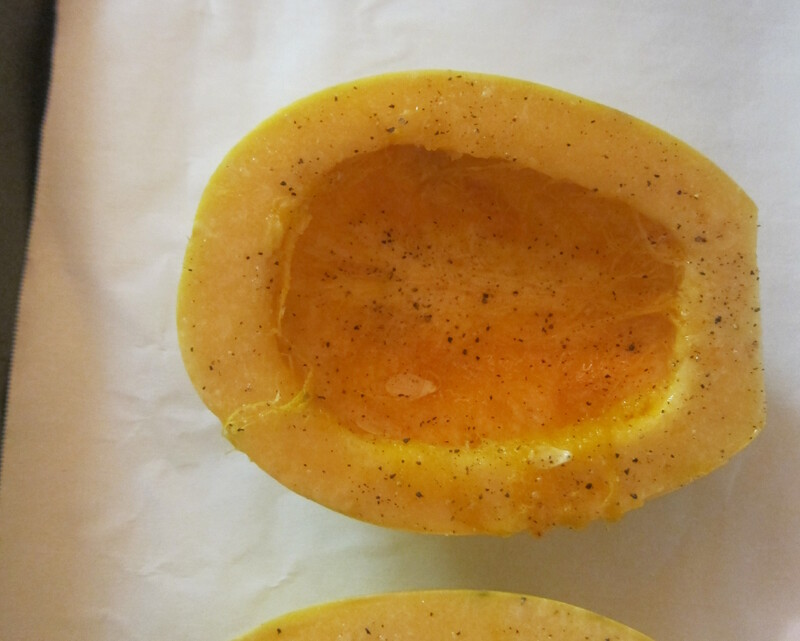 so, while the squash is roasting you are going to make your sauce. 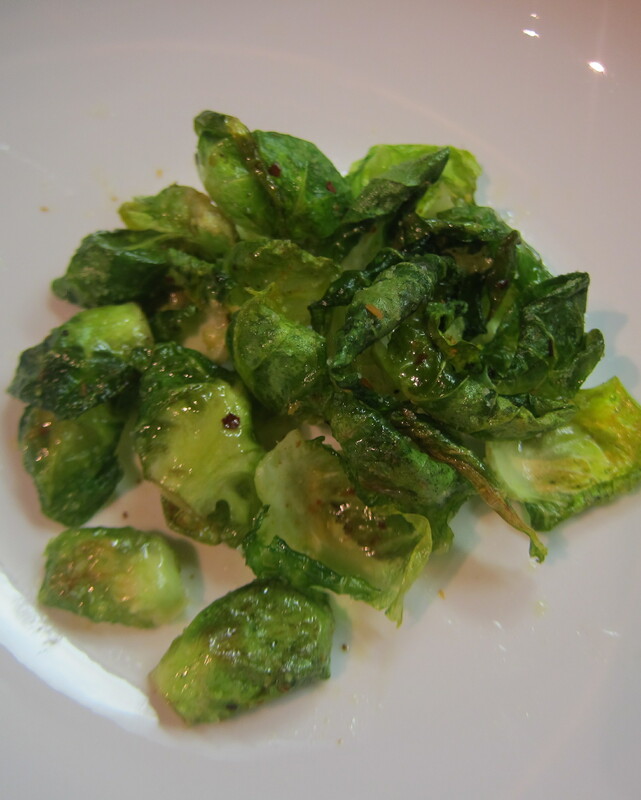 heat the tablespoon of olive oil in a small sauce pot over medium. add in the onion, cook about 3 minutes until translucent. add in a good pinch of crushed red pepper, dried sage, dried thyme. 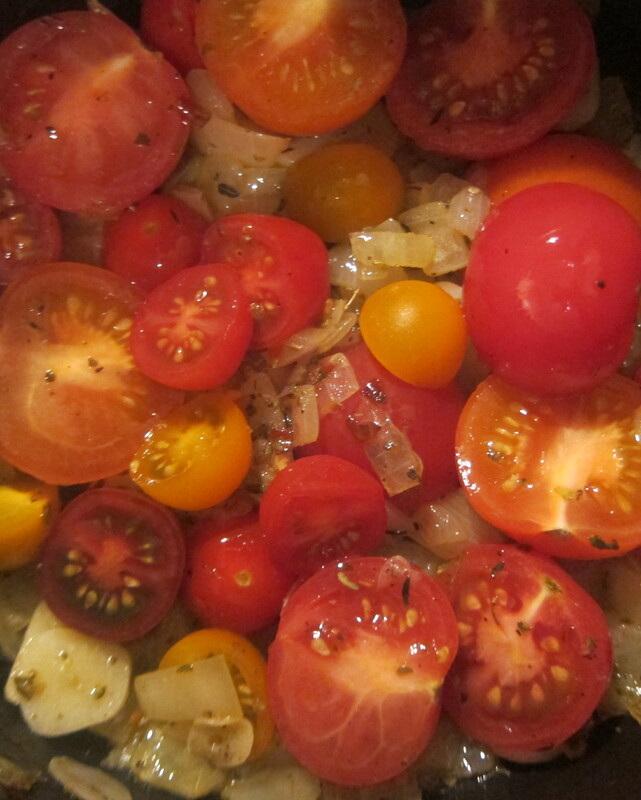 add in the sliced tomatoes and the slivered garlic. stir to coat in the onions and spices, add a nice pinch of salt and let it cook about 5 minutes, until the tomatoes get soft. 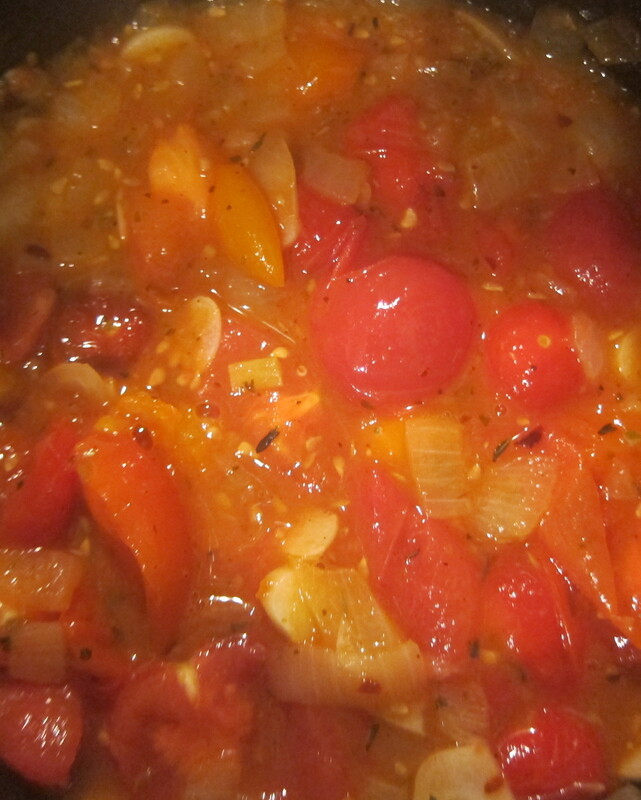 once the tomatoes are soft, use a wooden spoon or fork or whatever to mash up the tomatoes. you basically want to just break them all up so that their juices are released. 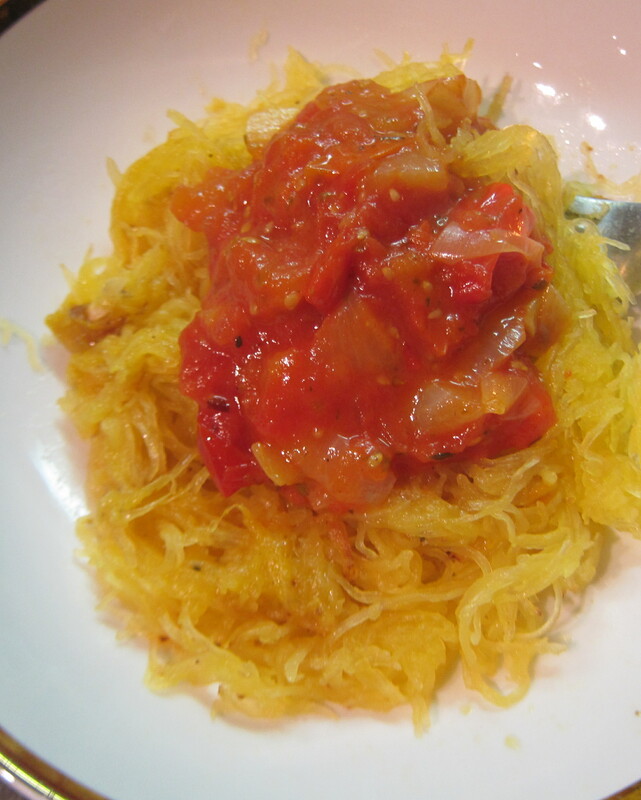 then, add the chopped tomatoes, stir and let it simmer for a while as your squash continues to roast. right before you eat it, stir in the chopped fresh basil and let it cook just for a minute. garnish your dish with some parmesan and more fresh basil if desired! confession: i didn’t have any basil OR any parmesan cheese 😦 but the dish would be prettier and yummier with both. ras el-hanout is a morrocan spice blend that is filled with lots of different flavor profiles and depths. 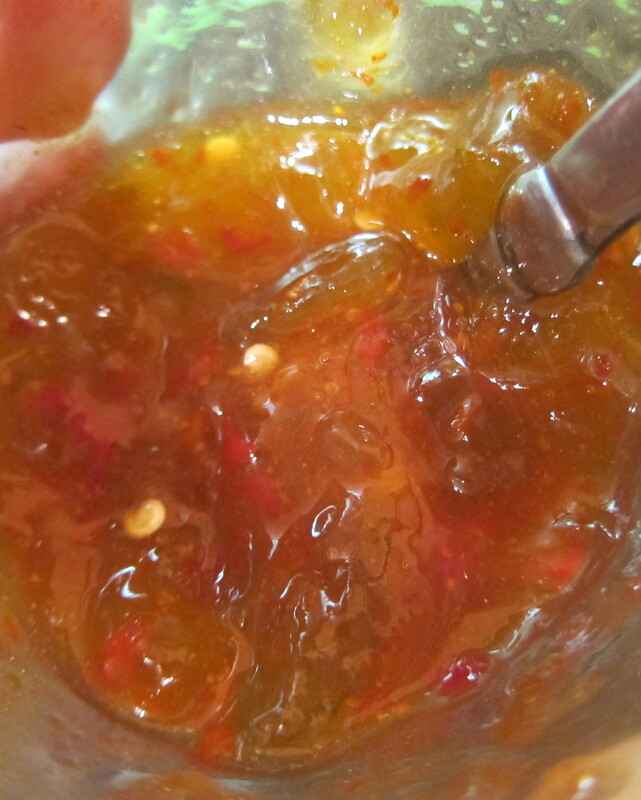 it’s savory, spicy, smokey, sweet and deliciously complex. 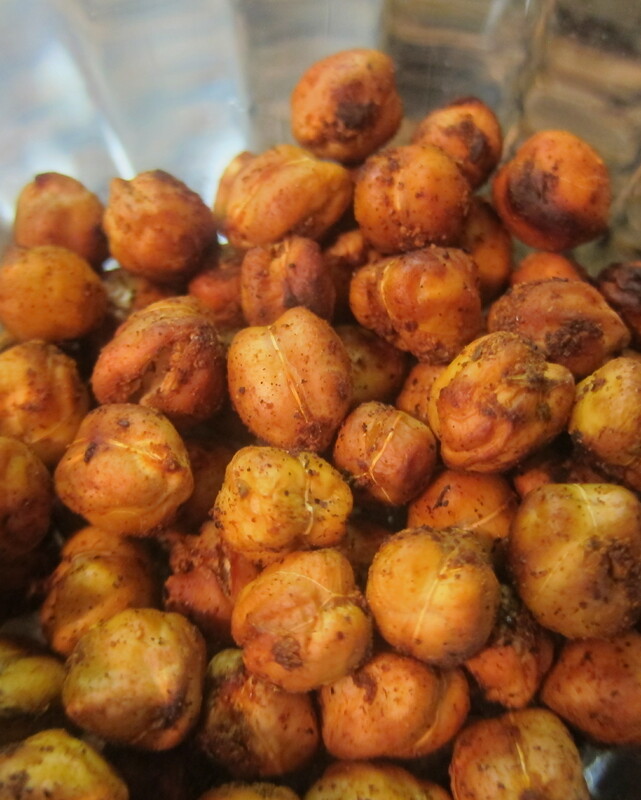 the spices i use for these chickpeas are very ras el-hanout-esque but are still a unique blend of flavors. 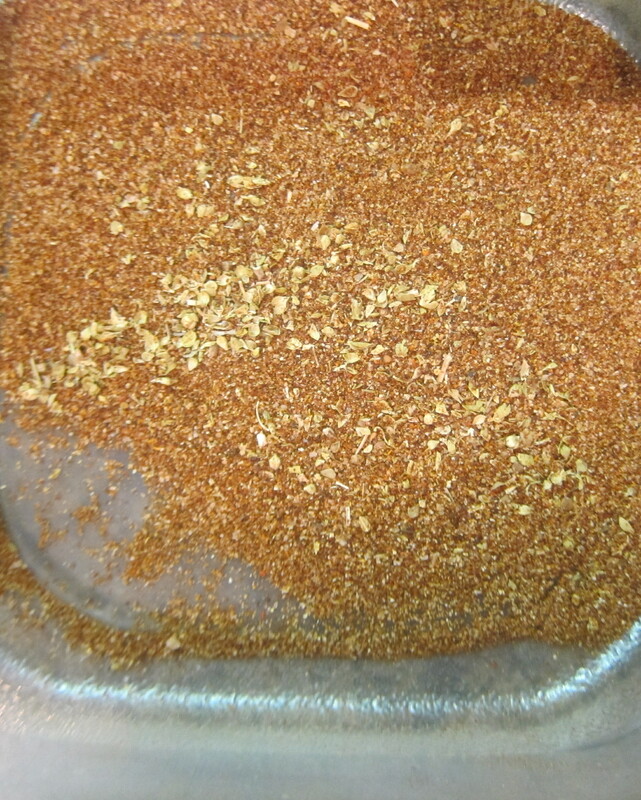 preheat the oven to 375. in a small tupperware container, mix all of the spices together. 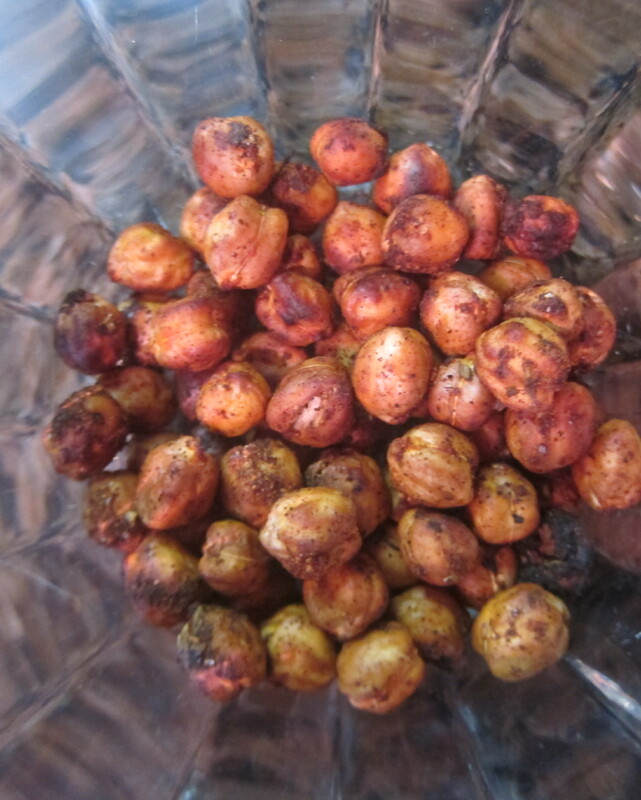 coat the chickpeas in the olive oil and toss into the tupperware. 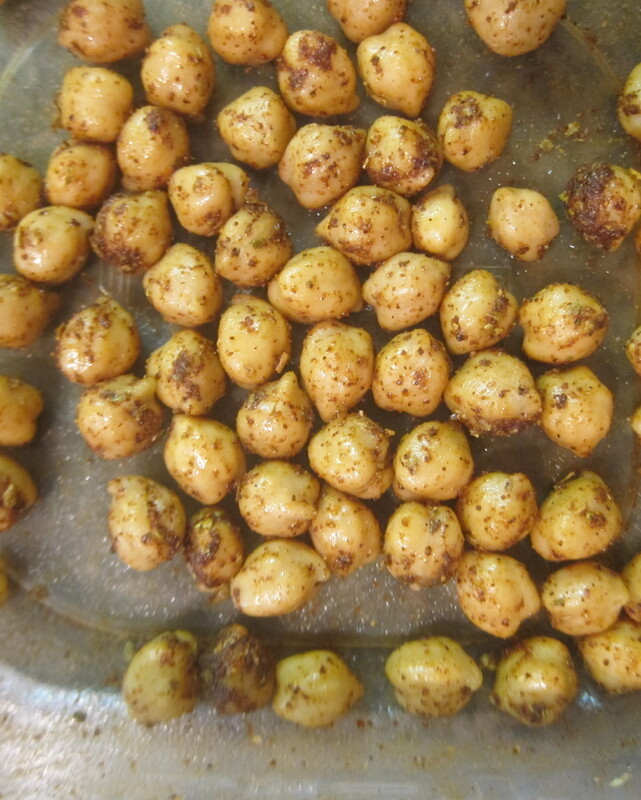 close the lid and shake shake shake like a polaroid picture until the chickpeas are happily coated 🙂 put the chickpeas onto a baking sheet and roast for about 10 minutes, until the chickpeas are crispy on the outside but still a little mealy on the inside. SO GOOD. 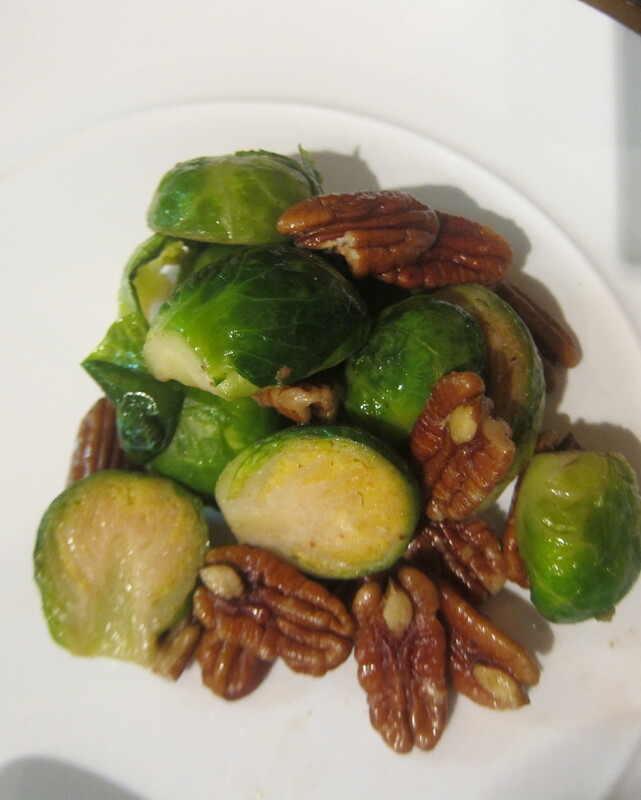 in this recipe, do not ommit the butter, and do not substitute olive oil. you need the butter to get the pecan flavor distributed through out. 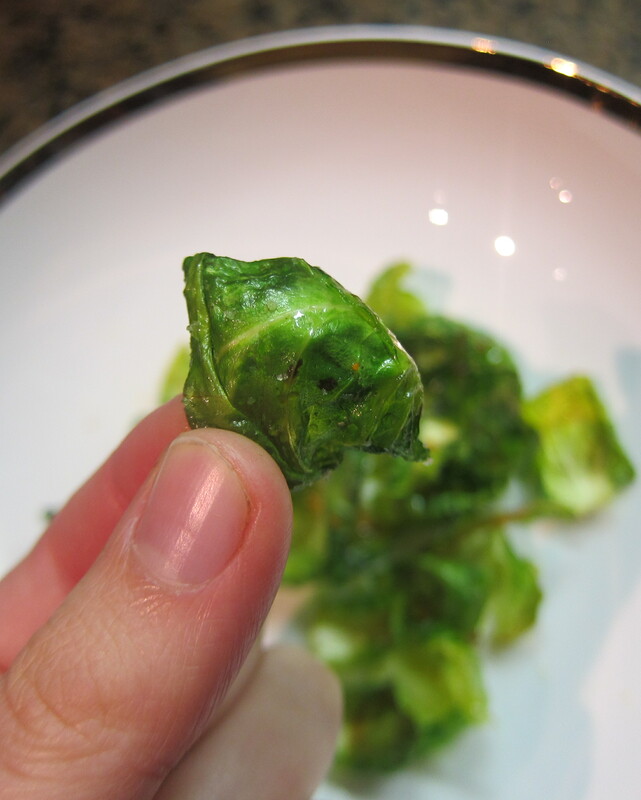 cut and clean the brussel sprouts: peel off any brown outer leaves and cut them all in half. bring a pot of salted water to a boil. 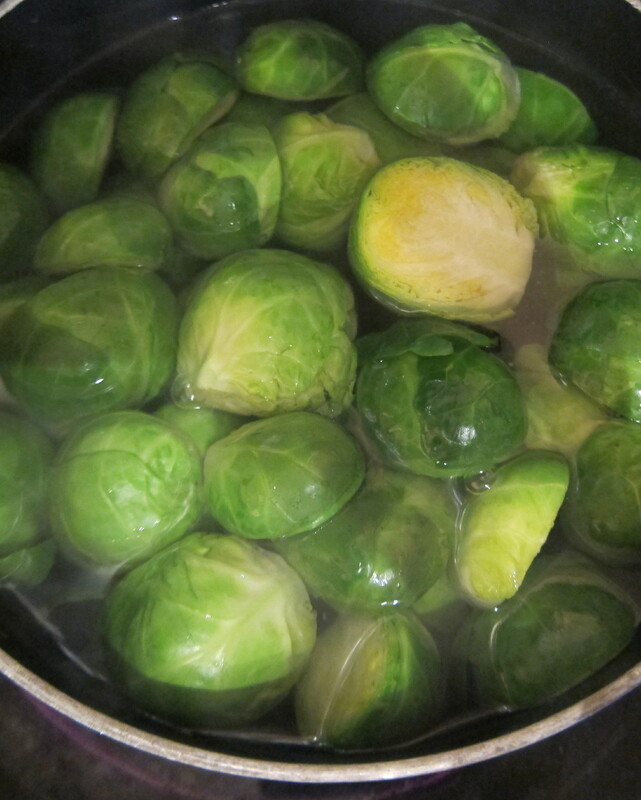 add the brussel sprouts and cook for about 3 minutes until just barely al dente and are bright beautiful green in color. melt the butter in a saute pan over medium heat. add in the pecans, coating them with the butter and let them toast for about 4-5 full minutes so that the pecans are really fragrant and have infused the butter with all of their nutty goodness. 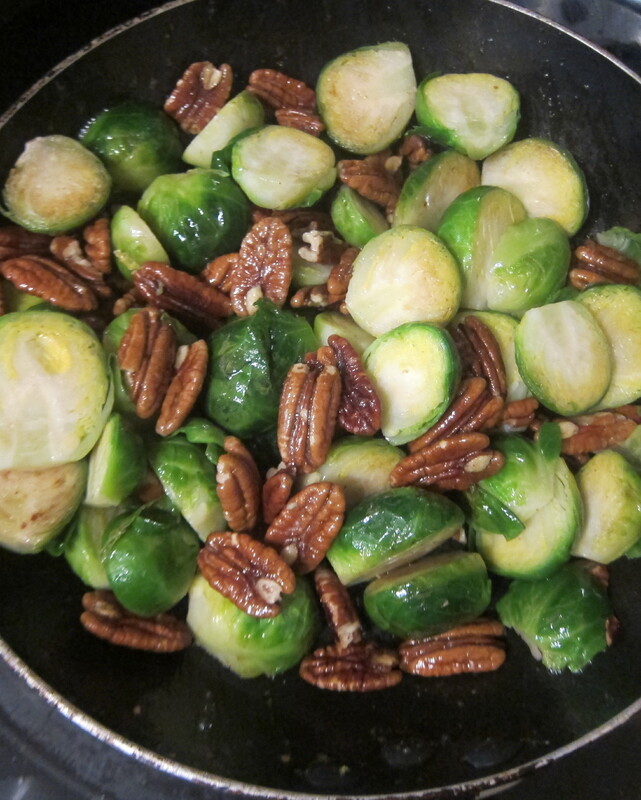 add in the brussel sprouts, toss to coat and add a large pinch of salt. 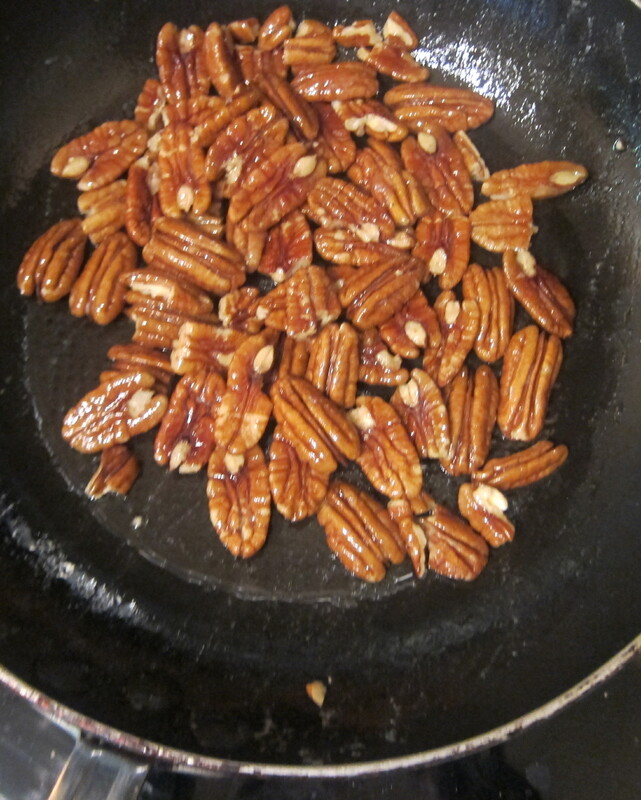 let cook with the pecans for about 2 minutes until slightly tender. SERVE!!! i KNOW its not a pretty plate. 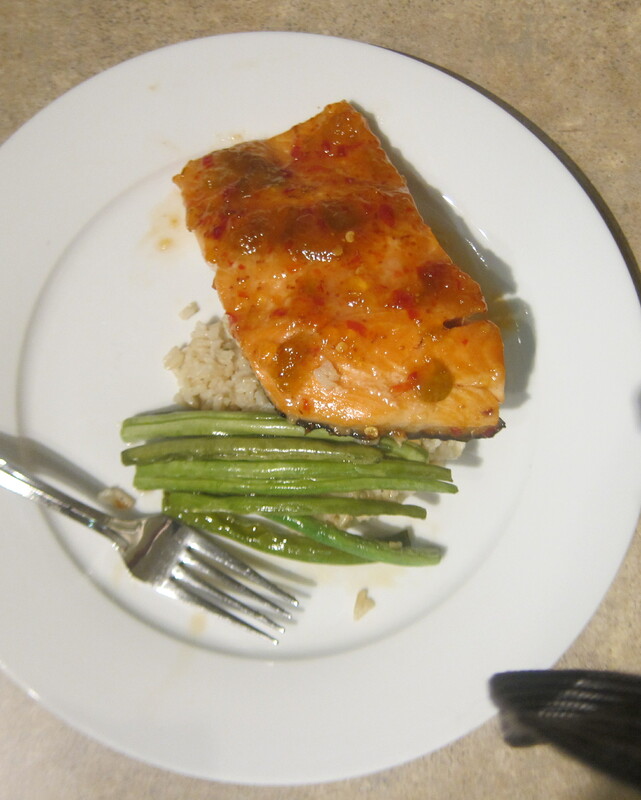 and i KNOW the salmon is huge and not seabass…I made seabass for me and my neighbors wanted me to make salmon for them. 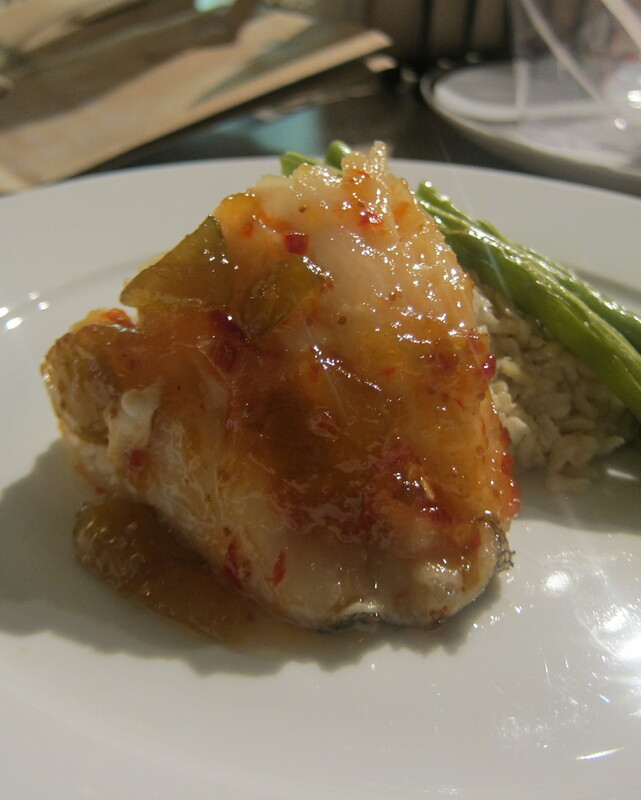 they eat large portions of salmon, i had a small portion of seabass which you will see further down in this post. it may not be a beautiful plate but it is beautiful tasting. i promise. 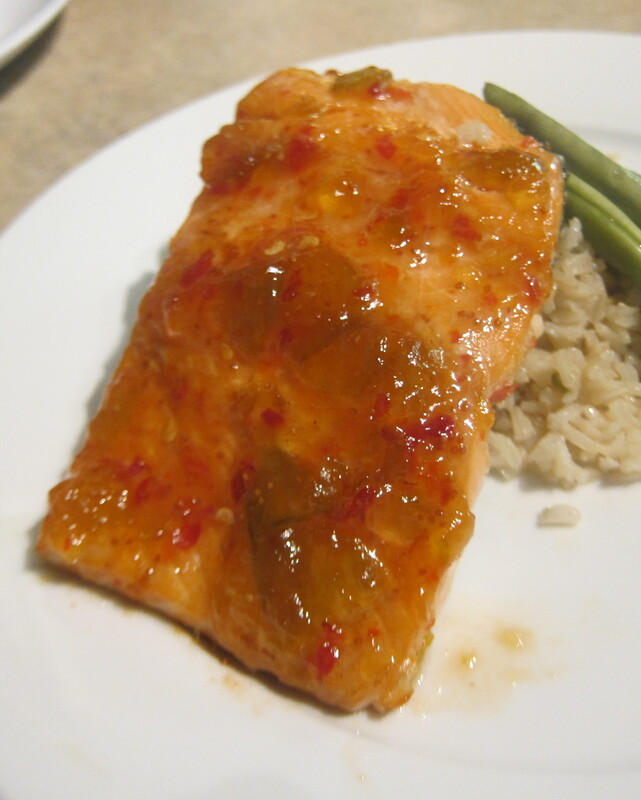 combine the chili garlic and the preserves, rub over each fillet of the fish. broil for 6 minutes, remove and baste with a little more of the sauce and then broil for another 5 minutes or until the fish is finished and flakes with a fork. THATS SERIOUSLY IT!!! IT IS SOOO EASY!!! Heat 1 T of olive oil in a sauce pot over medium heat. 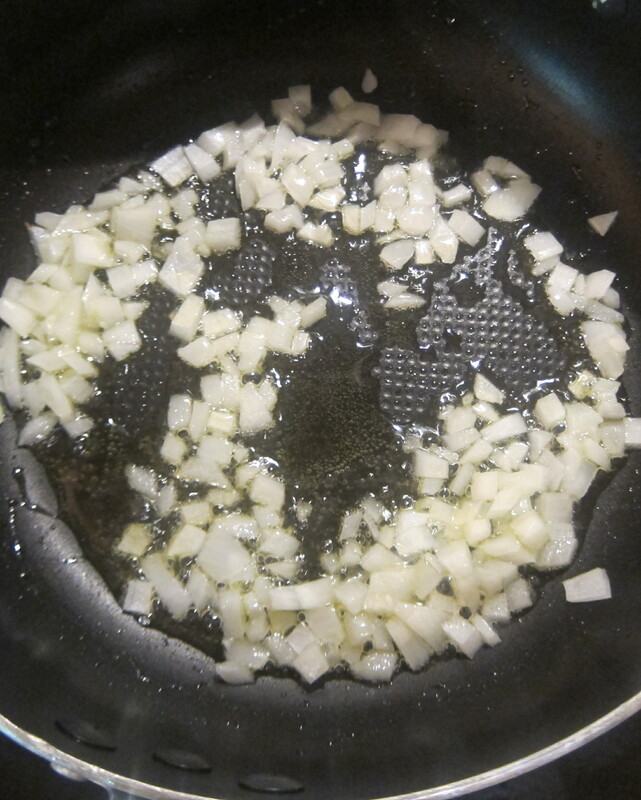 add the onion, let cook for a few minutes until translucent. 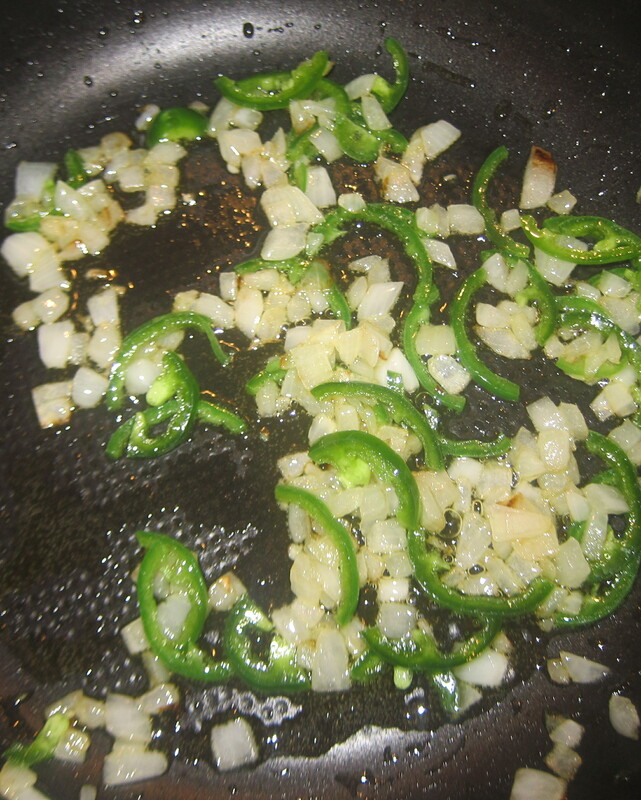 add the jalapeno and the rice. 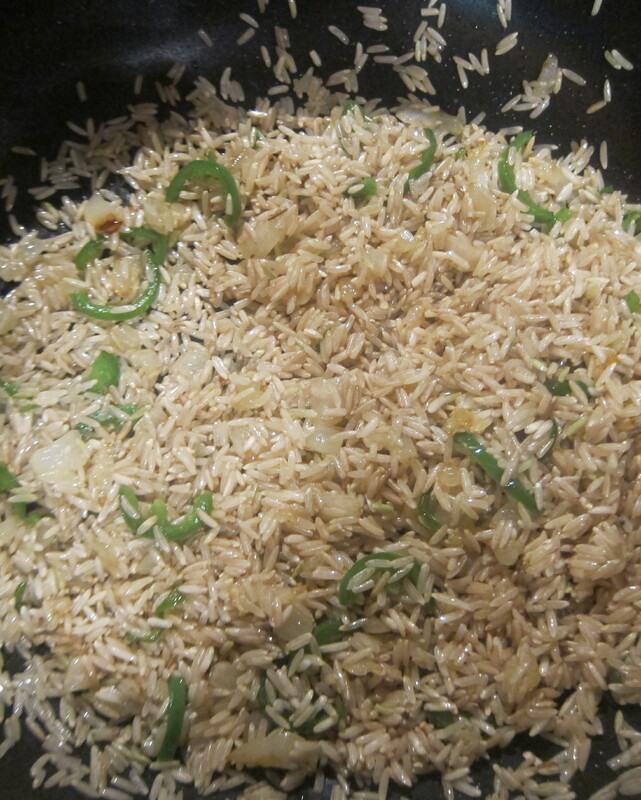 stir the rice to coat with the oil, onion, and jalapeno. let cook 2 minutes to toast the rice up. pour in the water, add the salt, a bit of the lime zest and the bay leaf if using. cover and bring to a boil, reduce to a simmer and cook about 30 minutes before lifting the lid. after 30 minutes check the rice to see if its finished or if it needs more liquid or more cooking. continue cooking as needed. 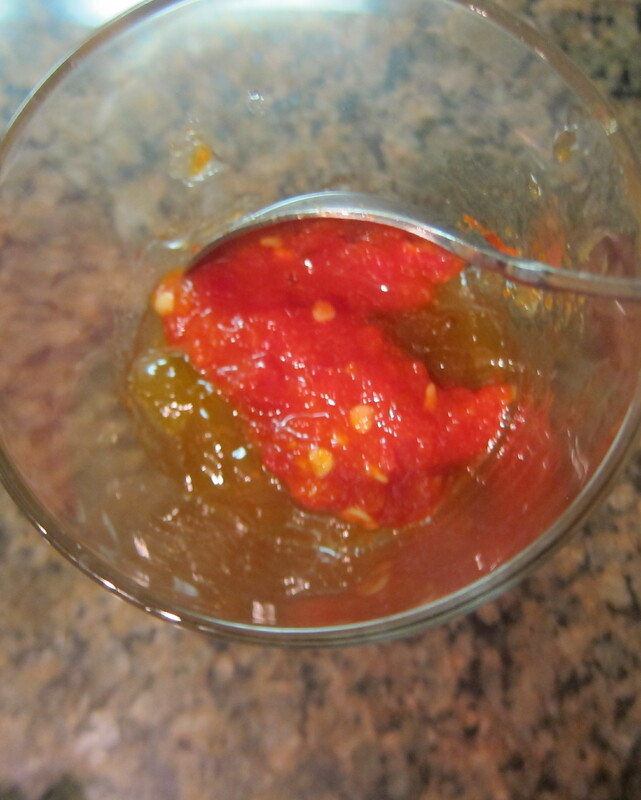 Once finished, add the juice of the whole lime, taste, adjust seasonings. 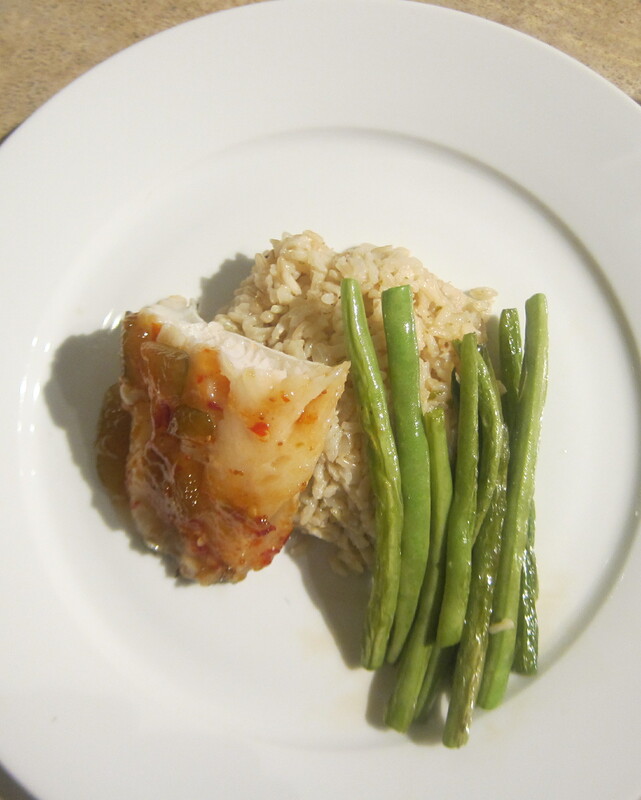 just saute the green beans in the sesame oil for about 6 minutes, add a sprinkle of salt. voila! there’s your simple, healthy and delicious meal! i had a little bit of leftover carrot and cucumber from my spring rolls, but not enough leftover to make more spring rolls. so, i made a quick salad! really really easy. 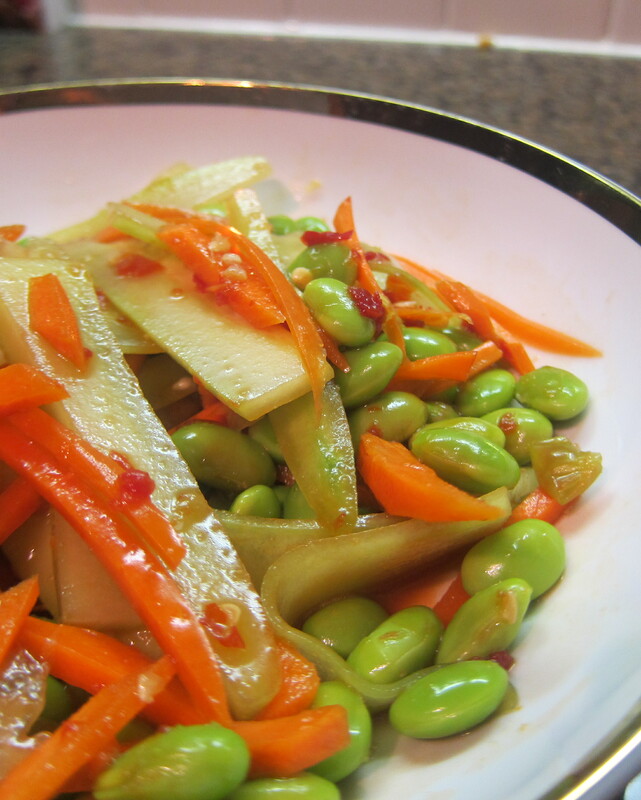 cook the edamame following the package instructions. 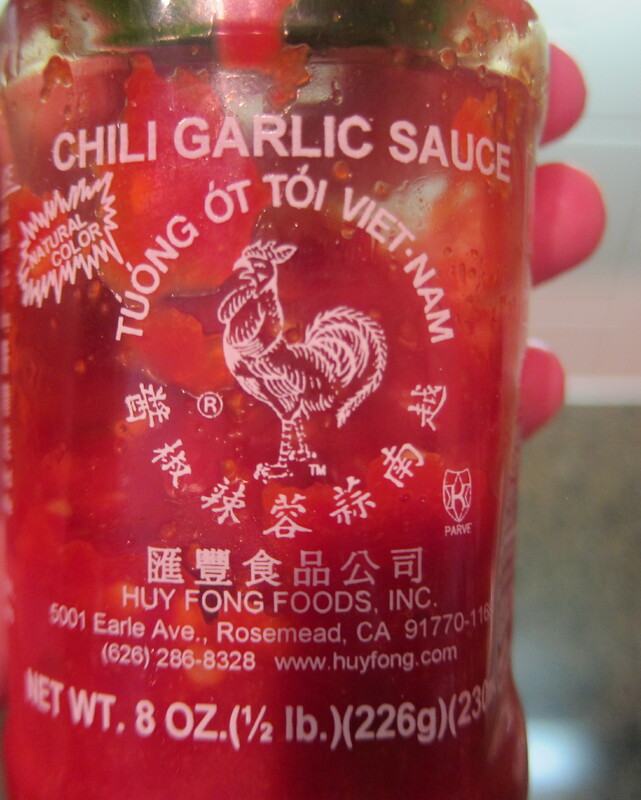 whisk together the vinegar, soy sauce, and chili garlic. 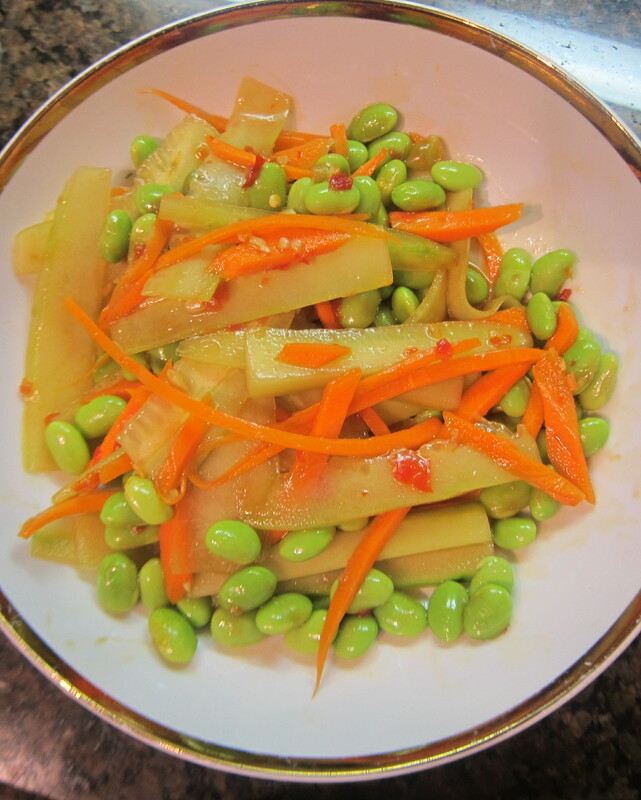 toss with the veggies. enjoy! !